The teeth that have been hand-punched on our imported Italian A1520 rasp are of medium coarseness. 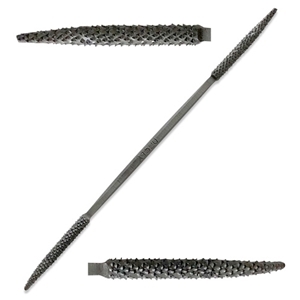 Its dual-ends are rat-tail (fully round) circular carving tips ideal for rasping holes and other curved shapes in your piece. Both are slightly hooked like a somewhat bent finger. You can easily remove unwanted stone and wood from your carving as well as work in cylindrical, concave and convex areas. Made from Italian C100 carbon steel by our master craftsmen, the A1520 is tempered for use on stone and wood. With teeth on both sides of the rasp as well as its edges, the A1520 can also be used on plaster. Replaces the R31 Medium Riffler-Rasp.